PRAIRIE GROVE – A mattress and a bed don’t seem like big things, but 14-year-old Samantha Kelly has a whole new appreciation for them. Kelly’s memorial is a replica mattress of the one described in Hana’s Suitcase, a nonfiction story the class read. Did the Nazis spread hay on the floor of the Jewish barracks, or did they use hay to stuff the mattresses on which the Jews slept? Today’s students in Arkansas should be studying the history of what Americans suffered during “the Great Depression.” I lived through the depression, and I did not have a mattress to sleep upon. Other members of my family were living in luxury: they slept on a substitute mattress, which was a cotton sack, filled with corn shucks. Hay was too valuable, as food for animals, to be used to stuff a mattress during the American depression. I saw and approached the hungry and desperate mother, as if drawn by a magnet. I do not remember how I explained my presence or my camera to her, but I do remember she asked me no questions. I made five exposures, working closer and closer from the same direction. I did not ask her name or her history. She told me her age, that she was thirty-two. She said that they had been living on frozen vegetables from the surrounding fields, and birds that the children killed. She had just sold the tires from her car to buy food. There she sat in that lean- to tent with her children huddled around her, and seemed to know that my pictures might help her, and so she helped me. There was a sort of equality about it. (From: Popular Photography, Feb. 1960). 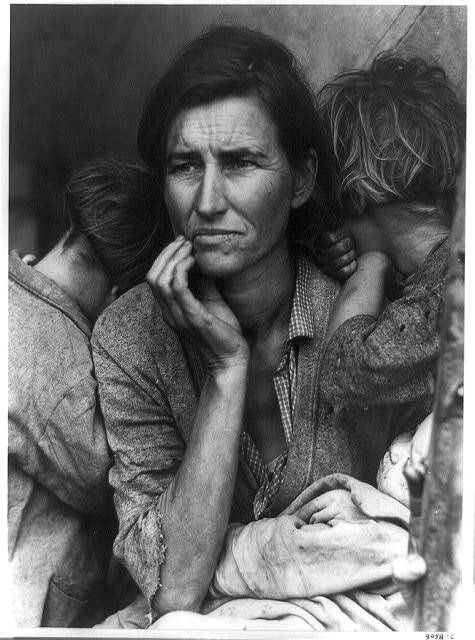 This is the caption on the photo above: Dorothea Lange’s “Migrant Mother,” destitute in a pea picker’s camp, because of the failure of the early pea crop. These people had just sold their tent in order to buy food. 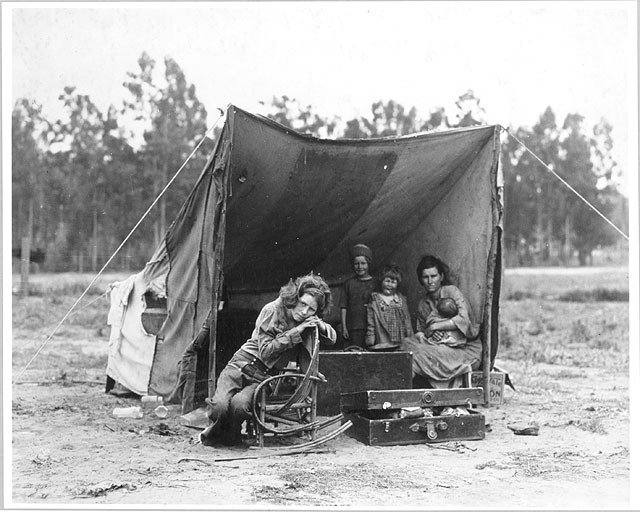 Most of the 2,500 people in this camp were destitute. By the end of the decade there were still 4 million migrants on the road. The state of Arkansas was one of the states that were particularly hard hit during the Great Depression. How did America finally get out of “The Great Depression”? World War II saved America because jobs were created and destitute men joined the Army or the Navy. Women found jobs in the factories which were set up to make war materials. This is what 8th graders in America should be studying, not what kind of mattresses the Jews had in their barracks in the concentration camps. It is hard to get students in America interested in any history, except the history of the Holocaust, which they start learning in kindergarten, but I think that Arkansas students should study the history of their state. There is a famous song entitled “Hey Oakie, did you see Arkie, out in Californy?” Arkansas students should start by learning to sing this song .